and i'm working on quilt tops and trying to keep a baby happy. ps. i'm dying to do a maesey update but her 6 month "half birthday" is right around the corner so i'll save it till then. suffice it to say, for now, that she is heaps of fun these days! This may be a dumb question.. But I've been a lurker forever now and I am bad at commenting.. I just wanted to say that I absolutely LOVE your quilts. I was wondering if your sell your quilts?? Love both of them.. cant wait to see the final result. I like the little square with animals on it in the pink one PS... today is Monday, January 19 (your entry say Tuesday, January 20)... thought you would like to know!!!!!! It is hot here today. For once I am glad to be at work in air conditioning and not in my 'sunroom' on the sewing machine! they're both really lovely and I'm sure will be enjoyed by the lucky little ones who get to use them. Both look like they are going to be so lovely! I love the fabric in the first picture. Is it a charm pack? imaginethatquilts, no, just a chosen few from my overflowing fabric collection : ) i decided to work with pinks and greens this time after making a custom fleur in these colours, they just work so well together! I love your quilt tops, they are looking beautiful. Can't wait to hear about Mae's update! 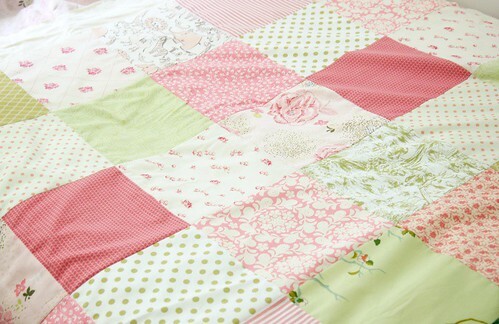 that pink and green quilt is perfect, i hope you make some more like it! funny you should mention fleurs, kelly, i was planning on working on some today! i should have some available in a week or two. now i'm off to visit your blog to sneak a peek at your baby girl : ) love babies. These quilts are lovely - so jealous. 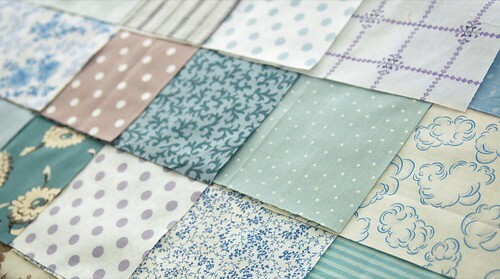 I have actually been wanting to make a basic machine-stitched quilt using a similar grid pattern. Do you know of any web pages/tutorials that give simple instructions on how to do this (I have basic sewing skills)? sorry, steph, i can't think of any off the top of my head but a quick google search might help? i bought a couple of books to ease myself into quilting as i thought it was going to be much harder than it is - i did a quick review of them here http://onegirldesignwrks.blogspot.com/2007/08/mini-book-review.html. good luck, it's super addictive! !